Atlanta — MoistureShield’s CoolDeck technology won Innovation of the Year at the 7th AQMAT Recognition Gala, held March 9 at the Fairmont Queen Elizabeth, in Montreal, the company has announced. CoolDeck, available as an option in two of MoistureShield’s composite decking product lines, was voted the most innovative product on the market this year by gala attendees. The group included nearly 500 directors of hardware corporations, leading manufacturers, service providers and merchants who are members of the Quebec Hardware and Building Supply Association (AQMAT). CoolDeck minimizes heat absorption by up to 35% versus traditional capped composite deck boards, for a more comfortable deck, the company says. The voting process for the Innovation of the Year was live during the Gala, at times comprising a tight race between the five finalists. CoolDeck ultimately took 30 percent of the vote to win. MoistureShield is distributed in Quebec by Canwel with Bruno Chapados, general manager of Canwel Construction Materials Division, accepting the AQMAT award. 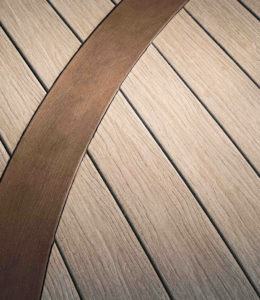 CoolDeck is available in MoistureShield’s Vision capped composite decking in Mochaccino and Cathedral Stone colors; and Infuse decking’s colors of Harbor Gray and Rustic Timber.